Cuckoo Catches the Cutters! :The heavy rains of late winter and spring of the last few years has meant that the commencement of the grass cutting regime for the Village Green has been pushed back until the ground is firm enough for the tractors to get on to it without getting bogged down. The reality of this is that cutting, which could commence as early as March or April does not now occur until late May. Although this disappoints some villagers, it cannot be helped. However, looking on the positive side there has been at least one ecological benefit which has derived from the pattern of late cutting. A relatively rare plant, which had nearly disappeared, the Cuckoo Flower, is now re-establishing itself on both greens and the Hoppit. This plant is a native of wet meadowlands of which the village green is an example. The Corporation of London is very keen to protect this plant. They also hope that other rare seeds may be encouraged to germinate if the area is not cut until they have developed and produced their seed. Although mowing will hopefully have commenced by the time you read this article, the Parish Council have agreed to set aside three areas on the two greens which will not be cut until early July. The top green (opposite the village hall) will be mown all around the edge of the greens to give access to seats and a broad swathe will be cut across the middle and opposite the village and church halls. This will allow for the area traditionally used by the Baptist Church youth groups for games on suitable summer evenings and for limited parking for Open Gardens Day. An area bordering on the 'The Green' opposite the cottages and bordering on the ditch running to the Pond will also be left. These areas will be marked by Corporation of London signposts. It is currently intended that this Green will be used as the main car park on Open Gardens day. All this grass will eventually be cut by the Corporation of London in early July. They will clear the cut grass at the same time with their special equipment and it will from that point on be cut to the usual mowing rota. This is an experiment in conservation to see how it goes and indeed to present the village green as a village green should be. It is hoped that by allowing the grasses and wild flowers to grow and seed naturally, we will also encourage wildlife as well in the form of butterflies and moths, thus restoring a more rural aspect to our village green in early summer. The Cuckoo Flower or Cardamine pratensis and it is a medium hairless perennial, sometimes tufted, with root leaves forming a rosette. The stem leaves are dissimilar. The flowers are variable,12-20 mm, lilac or white with yellow anthers from April to June. It likes damp places. The Conservators of the forest want parts of the greens to be left uncut so that the it can seed itself. As a result parts of the green will be set aside as conservation areas to encourage wild flowers. The strange cutting pattern on the greens is the result. Some like it, some don't. Let us have your vote. Strong Opinions? : Do you have strong opinions (like on the above subject) about whats good or bad in our village? The Web Site is thinking of starting an opinions page where you can have your say. Why not submit a short article of up to about 400 words for everyone to discuss. Either drop it into the Parish Office (perferably on Disk) or E-Mail it to us at Opinions. Viaduct: It is proposed to carry out Essential Improvement work to strengthen the Viaduct that carries the main road over the Underground Railway in August & September, this will mean traffic restrictions will be in place throughout this period. This Exhibition outlines the plan. For more details. Parish Council Information: Following recent Parish Council meetings there are is a lot of new information on their news page including a very important notice about the Theydon Bois Safety Audit. REPLACEMENT OF THE BENCHES AROUND THE VILLAGE POND : Villagers will be pleased to know that the four benches around the pond, despicably vandalised last year, are shortly to be replaced by four new metal seats made by villager Norman Riley to the same design as those sited along the Avenue of Oaks. We hope to have the seats in place well before Open Gardens Day. Brass plates bearing the inscriptions to villagers in whose memory the old seats were commemorated, will be fixed to the replacements. The Parish Council are very grateful to Norman Riley. Friends of Wansfell College Annual Garden Party on Saturday 7 July from 2 pm to 5 PM Something for everyone. Enjoy the garden, music, sideshows, games, demonstrations and stalls with cakes and jams, books, crafts, bric-a-brac, etc. Refreshments. The Stompers Jazz Band will play. The event will transfer to the Village Hall if it is wet. St. Mary's May Fayre: As always your Web Site aims to be first with the news and pictures. Click here (or on the picture) to see lots of pictures taken Today (28th May) at The St. Mary's Fayre and Fun Day which was held in the Church Hall Grounds from 11am. Dance Displays by the Jacqueline Hutchins Dance Group & the Rainbow Guides, Bouncy Castle, Kites, BBQ, Face Painting, Videos, Toys, Handicrafts, Jewellery, Cd's (your photographer picked up some great bargains), Cakes, Icecreams (I needed them), Sideshows & Games. It had it all including wonderful sunny weather. If you did not go (shame on you - you missed a treat) see the photos. Footpath Walk: The next Theydon Bois Rural Preservation Society walk will be Sunday 3rd June starting at 2pm from the Village Hall. This year promises some spectacular displays of flowers so it should be well worthwhile going along. All the Society walks are free. See Program of Walks for more details. Theydon Bois Horticultural Society: The Society holds it's Annual Show on Saturday 29th July at 2.15pm in the Village Hall. This event again raises some very much needed money towards buying flowers for St. Mary's Flower Festival. Please can you help with any donations of any homemade cakes, bringing them to the Village Hall by 1.30pm. Please contact Joan Maclean Tel. No: 01992 812187 or Margaret Davies Tel. No: 01992 812128 if you have any problems delivering your donations. Donkey Derby: The Theydon Bois Scout Group are again staging a Donkey Derby on The Plain, Coppice Row. Gates open at 12 noon with the first race at 2.00pm. This is one of the real fun events of the Theydon Bois year, there will be plenty of stalls and sideshows that will appeal to all the family. At the moment they still require Jockeys aged between 10 and 15 and donations for the various stalls would be appreciated. Please contact Peter Simmance Tel. No: 01992 814410. Village Hall: The proposed date of closure for the old hall is now the 10th August with the new hall scheduled to open on the 17th September. It is hoped to keep the period of non availability and the disruption to a minimum. Hopefully the weather will improve to aid the progress of construction. See below. Footpaths Reopen: Most of the footpaths in the Forest and surrounding land have now been reopened. Access to the Forest was restricted and all the footpaths were closed to reduce the risk to farm animals and the forest deer due to the present outbreak of Foot and Mouth disease. Please check notices to see if any specific areas are still subject to restriction but in general most areas are now open. The Preservation Society Walk on 13th May was very successful, the excellent weather (sunny & warm) and the informative background information supplied by the walk leader (Peter Newton, Chairman of The Rural Preservation Society) assured that the members of the Society and General Public present had a most enjoyable afternoon. See program of walks for the remainder of this years walks. 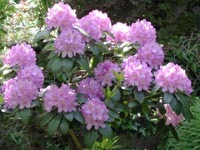 The next one to see the rhododendrons in bloom should be spectacular. Garden Waste:The EFDC "Green Bag" garden waste recycling scheme is due to restart on the 1st June. Please make sure that you bag your garden waste separately so that it can be recycled. Web Site Update: Hopefully you will have noticed by now that the Web Site is under going an update. It is hoped the the site will soon come under the auspice's of the Parish Council who will provide some seed funding until we can obtain some local sponsorship to cover the running costs. These costs which are fairly low, comprise mainly of the Web Hosting and Domain Names fees, all work on and for the site is being done on a volunteer basis. At present the site committee comprises three village people; Frank Jones (Parish Clerk) who will mainly be responsible for Content (contributions,financing, sponsorship), Tony Mitchell who originally started the site will now be responsible for Community Relations (public awareness, village users, demonstration) and Jim Watts who will look after Site Issues (design, editing, updating). These are not exclusive areas and we will all overlap and could use more help. So please remember the Web Site is for ALL the village community, if YOU want to help build it, have some input or ideas on how we should proceed - contact us and let us know. At least let us know what you think of it so far and keep us informed of Village Activities and News. WE NEED YOU! Village Hall: At present the new village hall is running about six weeks behind schedule due to the appalling weather conditions during the winter months. There will be no financial implications for the Council. The committee is now considering specifications for the floor coverings,stage, kitchen and phase two. It is proposed to close the present village hall before the new hall opens, this is to allow for it's demolition and and the creation of access to the new hall. Closure will be for about four weeks during August and September. Theydon Bois Drama Society: The society have two events in the near future at the Village Hall. May 31st - 2nd June sees their production of Ray Cooney's play "Run for your Wife". Tickets can be obtained from Carole James. Telephone number: 01992 812250. On Saturday 23rd June they present a Murder Mystery Evening in aid of NSPCC. Tickets for this are £10 each and you can book with Jean Stanley, telephone 01992 813073 or Diana Rumsam, telephone 01992 815125. Be sure to book early for these very popular evenings. Limes Link: Are currently reviewing their "workforce planning" to see how they can best meet the needs of patients. They are going to be employing a new full time salaried GP, and are currently advertising for this post. They are reviewing cover at both branch surgeries, but do not envisage major changes here. The minimum cover for each of these is 3 sessions a week. In light of Dr. Mc Crea's resignation they will be looking at the best options for the practice needs. Diabetic clinics have now been taken over by Dr. Tareq Abouharb in conjunction with Joan Carbine, the Nurse Practitioner. The new telephone system for the Practice was due to be installed on Thursday 5th April. COUNTRY DANCING New session starting on Tuesday, 1st May at 7.30 in the Village Hall. By attending you will help us to keep this club running and also enjoy a pleasant evening of gentle exercise and fun YOUR FIRST VISIT IS FREE. Open Gardens Day: This years gardens open day will be on Sunday 24th June. 2001 is a special year as it is the 21st time the village has opened its gardens and the Village Association is hoping for a lot of visitors to swell the funds for the furnishing of the new village hall. Joy Wainwright would still like to hear from villagers willing to open their gardens. In conjunction with the Open Gardens Day it is proposed to run a Scarecrow Competition in the village. The idea is for those interested to make and display a Scarecrow in their front garden and to give it an appropriate name. Visitors would be charged a pound to enter the competition and the person finding the most Scarecrows would receive a prize. There would also be a Scarecrow at the Village Hall with a separate competition to guess its name. Again contact Joy Wainwright if you are prepared to make a Scarecrow. Please contact us with your Latest News. E-Mail: Web Manager or send copy to the Village Office. Preferably on floppy disk.